Spend your days beside the soothing waves of Wailua Bay, which has made us a favorite Hilton hotel in Hawaii. Our beach hotel in Kauai offers some of the best hotel accommodations that you'll find on our magical island. Located along the Coconut Coast, Hilton Garden Inn Kauai also features generous hotel amenities near Kapaa's most exciting attractions, from Wailua Bay to roaring waterfalls and golden beaches. 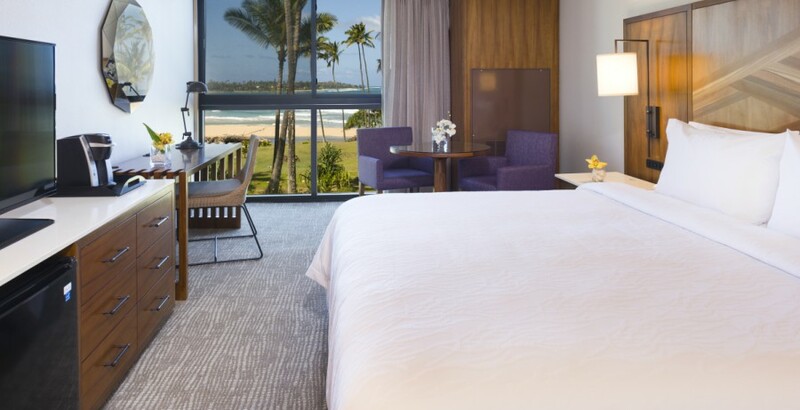 Inside our Kauai hotel by Hilton, you'll find spacious guest rooms, suites, and cottages - filled with all the amenities that you could ask for. Enjoy plush beds, kitchenettes with Keurig coffee makers, microwaves, and mini refrigerators, LCD TVs with satellite cable, air conditioning, and complimentary Wi-Fi to share paradise with your family and friends. Take a stroll and explore our inviting hotel in Kapaa. Upon arrival, you'll be greeted with our beautiful, open-air lobby that offers complimentary refreshments like lemon-infused water and teas. Our beachside location offers two pools, a lounge deck, and a whirlpool spa. We also have a delicious restaurant and bar, Garden Grille Restaurant & Bar, where you can enjoy American-Hawaiian cuisine for breakfast, lunch, or dinner. If you require anything at all, the hotel's front desk attendants are on-hand 24/7 to answer your calls. For adventurous travelers, our hotel on Kauai is the perfect base camp near the island's top destinations. Cascading waterfalls, sunny beaches, and lush parks are just moments away! There is also plenty of hiking, golfing, swimming, and shopping to enjoy. And lucky for you, our Hilton hotel offers coolers, chairs, and towels for guests to use on their island adventure! Holiday on Hawaii's most enchanting island at Hilton Garden Inn Kauai Wailua Bay. Nestled beside the lapping waves of the Pacific Ocean, our beach location will take your breath away. Our hotel is filled with modern amenities and comfortable guest rooms, and we're located near Kauai's best attractions. Join our mailing list to receive exclusive discounts, hotel news, and more.